I am doing a course on draping skirts at the moment – taking fabric, placing it on a mannequin, folding, pulling, altering the grain, working creatively to produce new silhouettes and styles. And, in doing this, I am massively influenced by the style and approach of Vivienne Westwood. However draping skirts on the stand is not trademarked; nor is this approach remotely restricted to Westwood. It is an ancient approach. If you think of how tartans and woven fabrics were first worn they would have been draped and belted, pulled up and arranged for comfort and to look good. I am keen to learn from her approach, but I don’t want to “copy” her garments. I actually want to understand some of her processes and get to “feel” how she creates certain styles. As I am concentrating on skirts my blog is full of skirts at the moment (sorry if it’s boring!). Thankfully next term we move on to bodices. But for now I am pushing the skirt envelop out a bit. Luckily I like wearing skirts – more or less every day. So while my bulging skirt wardrobe is a bit of a problem, it is not an insurmountable one. I will have a cull at the end. Here are some Westwood skirts. They are all more or less straight skirts with some folds or pleats at the front. I thought I would start with a version of the third one with a fold at the side seam. 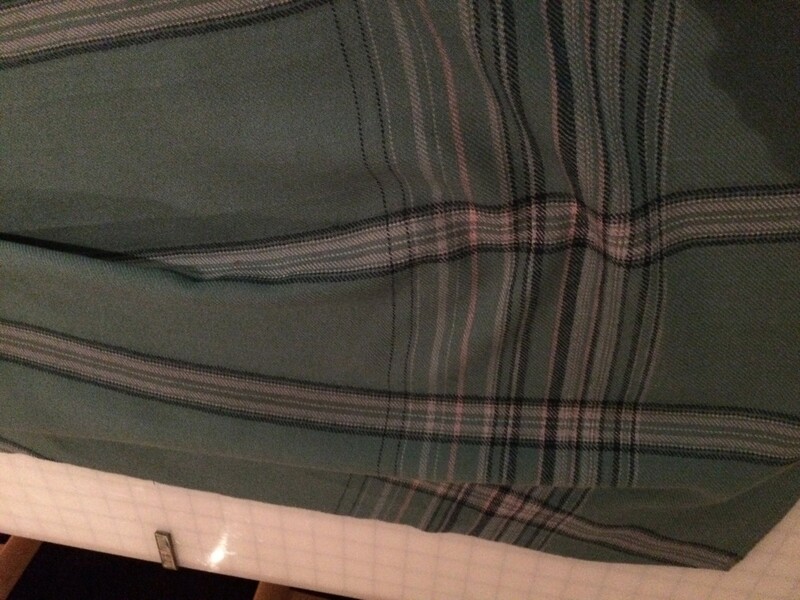 First I acquired a piece of recycled skirt fabric – the colours are a bit muted for me but I liked the way the plaid was a border print. You can see there is still evidence of the original pleating in the skirt but it didn’t have any stains, and I really liked the pink and deep green stripes. I was also able to recycle the zip so that was great too. Nicely woven, good quality wool is rather expensive so this seemed like a good way to start with my VW experiments. As I worked with this fabric, I remembered again how lovely it is to work with good quality wool. It is so nice to cut out, to stitch, and of course, to press. As the fabric came from a skirt it was a bit too short for draping I cut my VW skirt on the cross grain. Take a skirt length of fabric and place it on the stand at something of an angle, maybe around 45 degrees. Fold a big box pleat in the right side of the skirt (left looking at the mannequin in the photograph) so that it alters the grain in an interesting manner. I kept the top of the pleat just below the waistline, and the lower edge at the base of the thigh. Pin the side seam of the left side carefully, getting a nice curve but remember this is where the zip is going. Drape the back piece. I made this much simpler, just using three stitched down pleats at the back. Once you are happy with the look tie a cord around the middle and mark the waist. This is pulled in a little tightly – remember you will need some ease. If you look at the strong dark green stripe you can see how it starts a little off the CF at the waist, moves to the princess line at the hip, and then adjust slightly to the left towards the hem. Mark the waistline with a line of stitches. 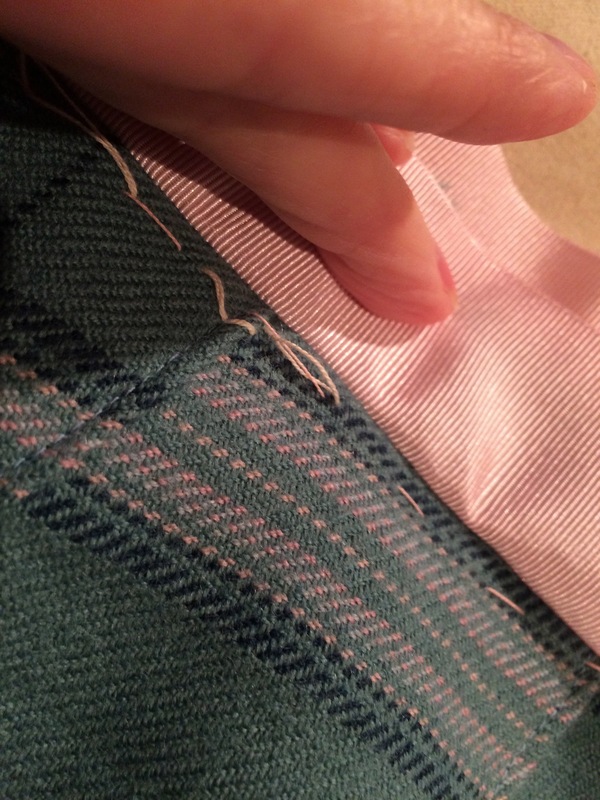 Then tack the side seams carefully, especially if matching the stripes is important to you. I did this while the skirt was on the stand. I also tacked the zip opening so I could try the skirt on. 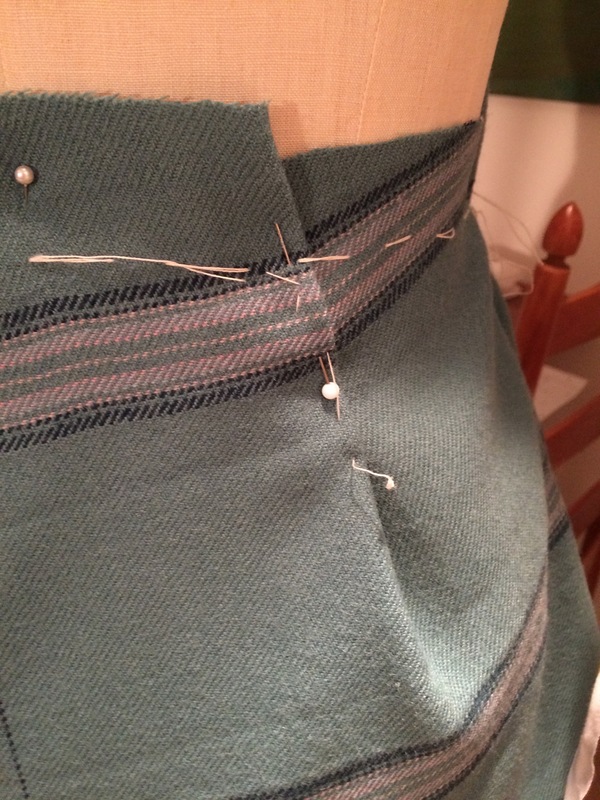 Baste lining to the skirt along the waist line seam. I just cut a straight tube of silk and pleated it in. I suppose I should have cut out the lining with exactly the same grain, in an ideal world. 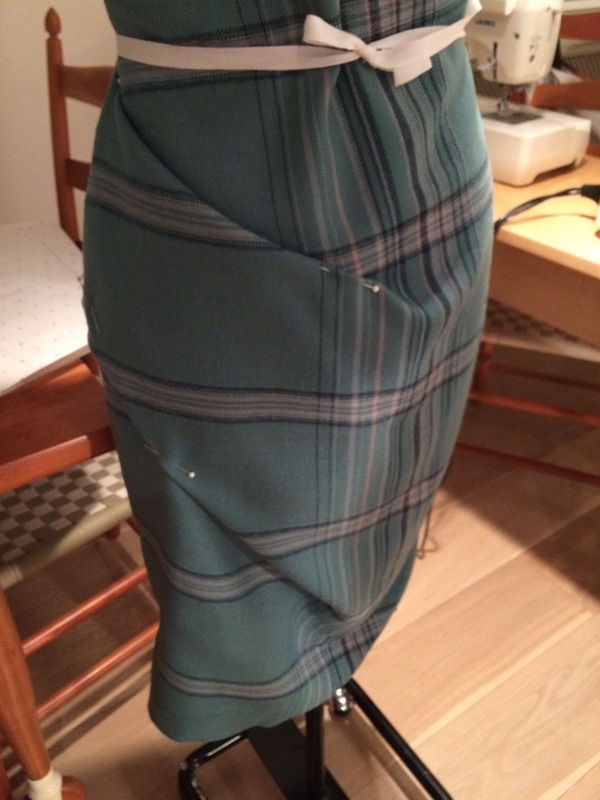 Although the Vivienne skirts all seem to have waist bands I am not that keen so I used a tecnhique I prefer. Which is to attach wide gros grain ribbon, to trim, understitch and attach to the inside of the skirt. Finally I got my daughter to pin the hem. 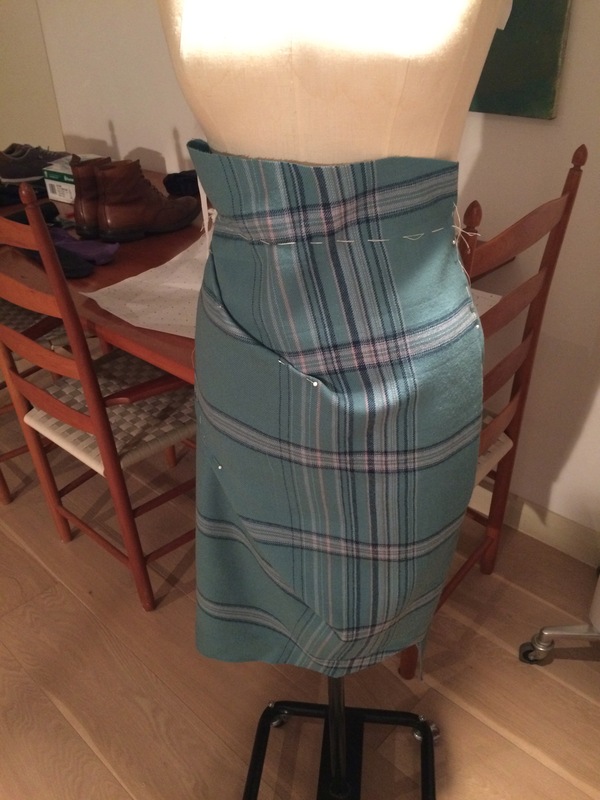 Unlike a normal tartan skirt we didn’t want to follow the grain – although that would be a perfectly acceptable hem – but it would be asymmetric. While I can celebrate an off grain if it is designed that way I don’t like an uneven hem. 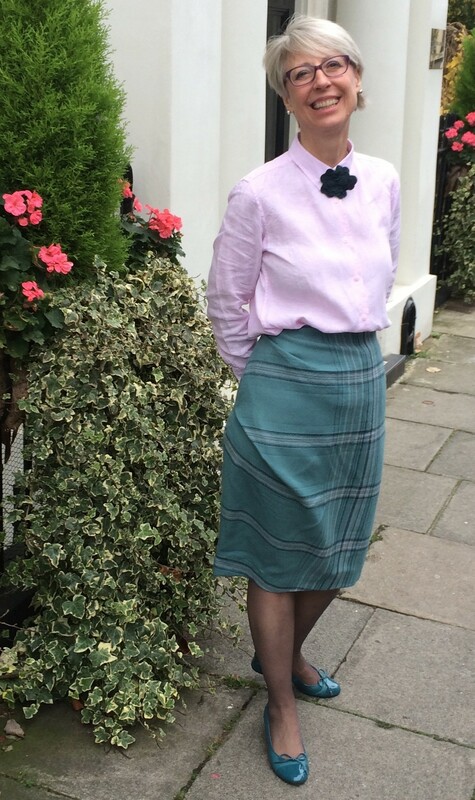 And here is the skirt on – I am embarrassed it so creased, but I really enjoyed wearing it. I will do some more work on this skirt as I think it is really an exciting look. Not too extreme, but just an interesting way to play with plaids. I am certainly having a good time following your skirt draping posts. Another great skirt, great colour and style. Thank you for this post Kate. I love this style of skirt, I think I might have to try this one myself; I’ve never done any draping so it could be a complete disaster, but your instructions don’t seem too difficult to follow. It is not very difficult to do. I will write up how to do it with flat pattern cutting if you prefer that method. That’s a lovely fabric and what a perfect match for your shoes! I really like the effect this draping gives. I think your skirt is fabulous. This is a very accessible style – as you say, exciting but not too extreme. I love the border print plaid. I’m currently working on a tartan in a much more traditional way. I am looking forward to seeing how you get on, especially as your tartan is your own. It is such a romantic idea. This looks great with the particular textile design–plaid in front and those long stripes going in different directions on the side. Nice interpretation of the Westwood look. Don’t be afraid to use very deep pleats as much of the interest of her designs comes from the juxtapositioning of the grain lines. She often offsets by almost 45 degrees which makes the pleating look very intentional. I really like the middle view but it does require ample fabric. Thank you Mary. I like the middle one the best too. I will try the one on the left next, and then the middle one. Also want to do a modern bustle look too. I am so grateful for your support and the special blog you did on the draped, asymmetric skirt, which other readers might enjoy. Really enjoying following your draped skirts series. Thanks for your detailed step by step explanation. This one looks do-able for the uninitiated. One day when I feel brave enough, not so much as in brave enough to try draping, but sigh, brave enough to face up to my tummy issues, I would love to give this a try. Might be challenging though as I have no mannequin! You look lovely in this skirt! Your tummy issues are minor and I think this skirt would be nice on you. I have a flat pattern tutorial coming up. It is very doable with your straight skirt pattern, and you don’t need a mannequin. Having seen this skirt in person, I really like it. Thank you for the tutorial, I think this is a look I would like and perhaps will try. I have a plaid I’m never really going to do anything with that would actually be fun in this look. Use that plaid Elizabeth! I will be showing how to do this effect with flat pattern cutting in a few days. It is quite good fun and not hard. Really enjoying seeing the results of your skirt draping, especially on a curvy figure. I LOVE VW’s designs but they can be so hard to pull off on a more shapely figure. An I’m with Mary, the more dramatic, the better! Cute skirt and with way less bulk at the waist so it is flattering and interesting for the eye. Do you have a back view too? I’m guessing the zipper is in your left side seam? The zipper is in the left side seam. I agree that transferring the waist darts is a great idea to create the flatness across the front. The next iteration will have a more traditional back view. This one was one experiment too far (will email you). Love this. It works so well with the plaid to give your eye a journey to o travel on. No wonder you like wearing it, really looks great.